Chief Inspector Wilbur Violence of the Essex police force has been in the news following the introduction of his latest radical anti-crime initiative. "We've experienced a sharp increase in burglaries during the past couple of years," the Chief Inspector told us. "Hello, yes? Well, these naughty chappies have been breaking into people's houses and having it away with their valuables, don't you know. Well, we can't be having that - not if they're not prepared to cut us in. 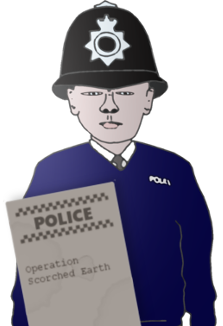 So that's why we here in the Essex constabulation have initiated Operation Scorched Earth." The emphasis of Operation Scorched Earth is on crime prevention rather than detection. Householders are invited to take their property down to their local police station, where trained crime prevention officers will carefully note down serial numbers and distinguishing features, mark the item with a special ultraviolet pen, then incinerate it will a heavy duty flame thrower. "The idea behind Scorched Earth is that if you remove the temptation, you remove the likelihood of crime," the Chief Inspector explained. "Thank you, yes? You see, your criminal type is a smart fellow. He's not going to waste time and energy breaking into your house if he knows your stereo's been reduced to a pile of ashes. Oh no - the street value of a bag of ashes is practically nothing. We know this, because we've done a survey." The operation has so far proved to be a remarkable success, slashing the number of burglaries in the area. So successful, in fact, that the Chief Inspector plans to extend the scheme for another six months. "We're not going to rest until we have completely eliminated the threat of burglaration from our streets," he told us. "Or at least, not until we've come to some sort of arrangement regarding percentages, anyway. Thank you very much."